Staying in to celebrate this Halloween? Leave the tricks at the door and bake up some delicious, sweet treats for your guests. Whether it’s a party for your friends and family or simply entertaining the neighbor kids these cookie remixes are an easy and delicious way to treat all your guests. Have a potluck coming up and need an easy dish to share? Something that is healthy and flavorful, but doesn’t take too much work… Well here is a new twist on an old favorite. 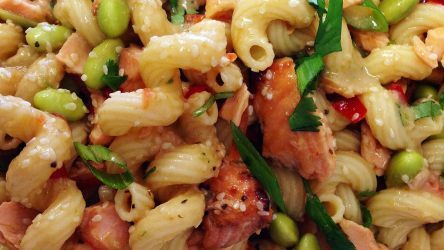 You can easily turn your Sesame Ginger Salmon into an Asian-inspired pasta salad everyone will be raving about. We all know the month of September can be hectic. Kids are heading back to school. Fall sports and after-school activities are starting up. While getting into the routine of it all after the slow months of summer, it’s easy to feel like each member of the family is going in a different direction. The 30 Day Dinner Challenge gives you the opportunity to focus on spending time as a family around the dinner table during this busy season. To help you through the #30DaysofDinner, we’ll be sharing a new meal plan here each week so you never run out of ideas. Make sure to follow our #30DaysofDinner board on Pinterest to get even more recipes for easy dinners, delicious sides, and even a special dessert or two! Save a little time this Monday by fixing the Monte Cristo Chicken from September’s menu. Just pop it in the oven and your family will be enjoying this savory dinner in no time. Serve with these Baked Asparagus Fries from our #30DaysofDinner Pinterest board. Busy day? Just pop the Layered Ravioli Bake from September’s menu in the oven or let your family do it for you and you’ll be enjoying more time where it matters most! Start off your week with a no-hassle dinner. All you have to do to take the Firehouse Three Cheese Pasta from August’s menu from fridge to table is pop it in the oven. Serve with Finishing Touch Garlic Bread and a Caesar salad. Take advantage of a day off from work and school by fixing Texas Roadhouse Burgers with Seasoned Steak Fries from August’s menu. Serve with a fresh side salad for a meal fit for a celebration! Try something new by fixing the Chicken in Herbed Mustard Sauce Recipe from the Dream Dinners cookbook.